0.54.0 is mostly a bugfix-release, but also some nice improvements. 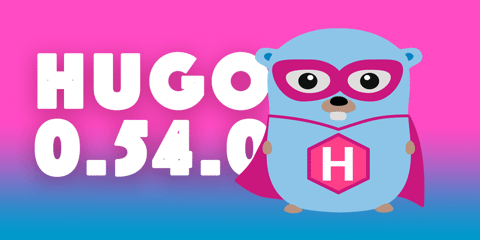 This release represents 27 contributions by 7 contributors to the main Hugo code base. @bep leads the Hugo development with a significant amount of contributions, but also a big shoutout to @tryzniak, @anthonyfok, and @mywaiting for their ongoing contributions. And a big thanks to @digitalcraftsman and @onedrawingperday for their relentless work on keeping the themes site in pristine condition and to @kaushalmodi for his great work on the documentation site. Many have also been busy writing and fixing the documentation in hugoDocs, which has received 38 contributions by 17 contributors. A special thanks to @bep, @kaushalmodi, @onedrawingperday, and @peaceiris for their work on the documentation site.